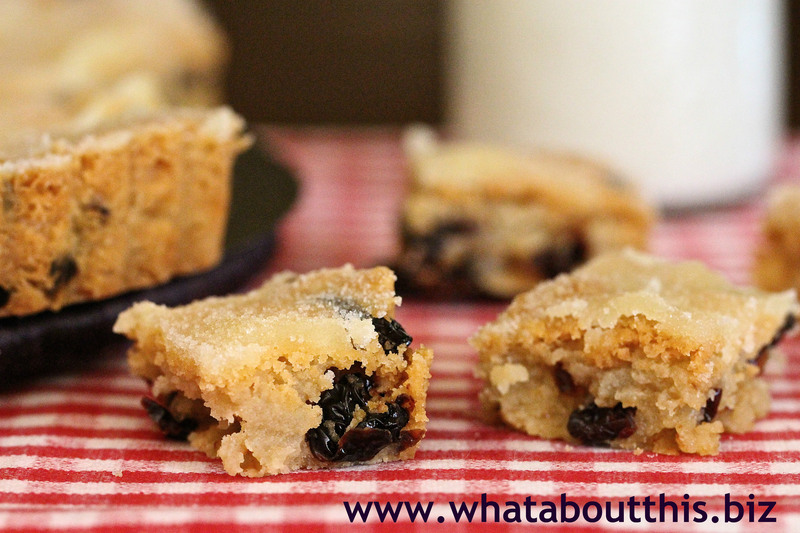 Dried Cherry Shortbread | What about this? Bigger is better, especially when it comes to cookies. Not because you get more yummy-in-your-tummy, but because big cookies are meant to be shared. For casual entertaining, have fun and save time by making big or “slab” cookies. This delectable shortbread recipe starts out in a large tart pan, but ends up being cut into shareable squares. Or like Salted Butter Breakups, a recipe which I wrote about over a year ago, you can break it up with your hands and share pieces with your friends. 1. Preheat the oven to 350°F. Have ready a 10-inch tart pan with a removable bottom. 2. In a bowl, whisk together the flour and salt. Set aside. 3. In a large bowl, using an electric mixer on medium-high speed, beat together the butter and 1¼ cups of the sugar until light and fluffy, 2-3 minutes. Beating on low speed, slowly add the flour mixture, beating until almost incorporated. 4. Add the vanilla and dried cherries and beat on low speed just until the dough forms large clumps and pulls away from the sides of the bowl. 5. Using your hands, evenly press the dough into the tart pan. With a fork, prick the entire surface, making holes 1/4 inch deep at 1-inch intervals. 6. Place the pan on a baking sheet and bake until the center is very lightly golden brown, 30 to 35 minutes. Immediately sprinkle the remaining 1/4 cup of sugar evenly over the shortbread and use a sharp chef’s knife to cut it into squares. Let cool in pan, about 30 minutes. 7. Remove the cookies from the pan and store in an airtight container, layered between sheets of parchment paper at room temperature for up to 4 days. 1. For the best flavor, use a quality brand of butter. 2. Check the shortbread after 25 minutes and keep an eye on it, so it does not get too dark.